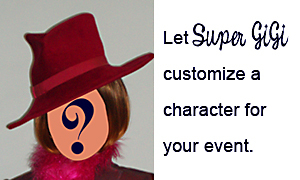 Super GiGi is a colorful character who can make any setting creative and memorable. 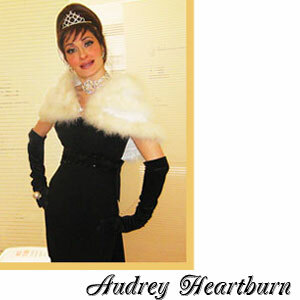 With great attention to costume details, and quick wit she adds stylish glamour to your event. Whether she's delivering a punch line or a pizza she is entertaining, engaging and fun. 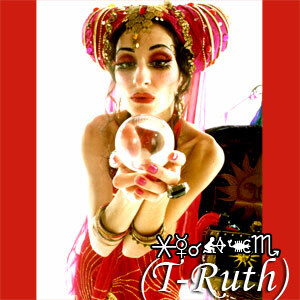 T-Ruth The Funky Psychic - Comedy Psychic. T-Ruth keeps the fortunes rolling fresh, funky and fun. She is a fast food psychic specializing in Taro on the go, it keeps the party' s future bright. New York's number one party gal brings that extra Holly Golightly spark to all occasions. Not only that, she will bring breakfast from Tiffany's, Rolaids included....Dahling. This glorious sea creature is the real catch of the day. She is the big one, that didn't get away. Bring your bait and tackle. 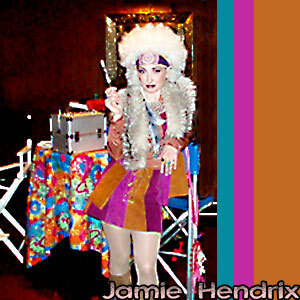 Costume courtesy of Gregangelo's Velocity Circus. Divining the future with water. The humor is dry and the fortunes are all wet. 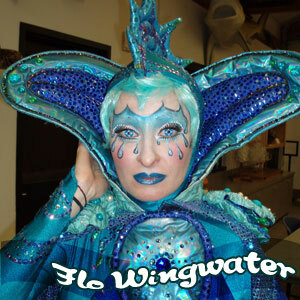 Remember every great party needs a little Flo. 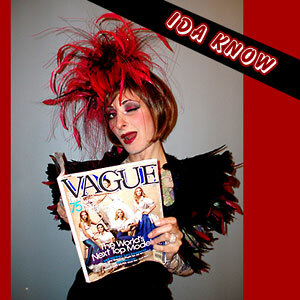 This magazine Maven would put Tina Brown to shame. Whether she is weighing in on the latest fashion trend or commenting on the newest super model, Ms. Know is always...well...uhmmm...you know...kinda...? K-Kaw's #1 News Reporter and party paparazzi. She gets the poop on all your party guests (it's good luck!). 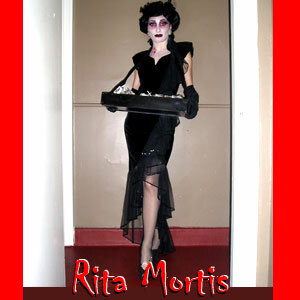 She even has her own side kick, Rita Rooster. This bossy boots will tame your guests! Tiger real, eyelashes fake Grrrrrrrrrrrr. 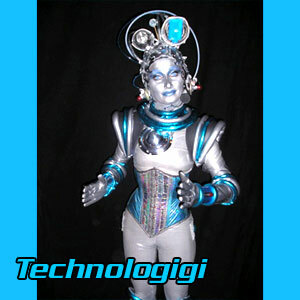 Costume courtesy of Gregangelo's Velocity Circus. A high-tech hostess and the only technology you can count on. Comes with her own memory schtick. Pablo's gifted daughter. Paloma paints jewelry on you perfectly. Paloma says Ciao to all of you! A San Francisco psychedelic flashback to late 60's early 70's, you dig man. The vibes are all good and the funk is in the the trunk. Power to the people! This 1930's aviator crash lands at your party. 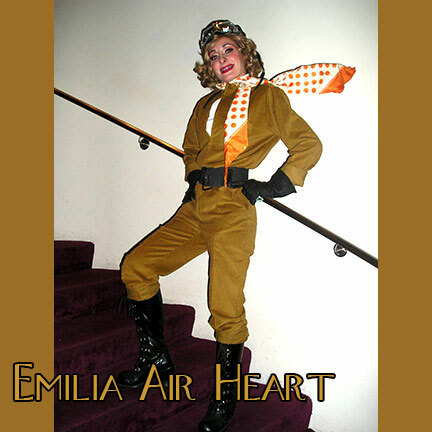 Her head in the clouds and heart in her B-52. She not only flys them, but drinks them. 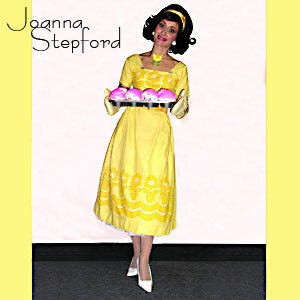 Joanna Stepford - The Perfect Hostess? Joanna has lovely manners, impeccably dressed, hair coiffed to perfection, knows how to please her dinner guests. However, her harddrive is a little bit wonky. Hide the silverware! Wisecracking 70's duo re-working their greatest hits and reliving their greatest flops. We got you babe! Country western gal proves stuffin is not just for turkeys anymore! Pa pow pow! Skates into the hearts of young and old. As unique as a snow flake, but not as flakey. 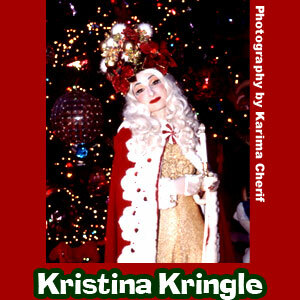 Although she is much much MUCH younger than Santa she is well versed in the makings of a perfect holiday gathering. 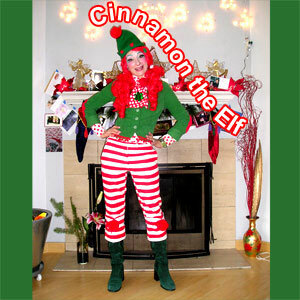 Cinnamon has been working for the big man for years. Keeps the spirit ALIVE . Paints dolls faces and names toys. Don't let her cool exterior fool you. 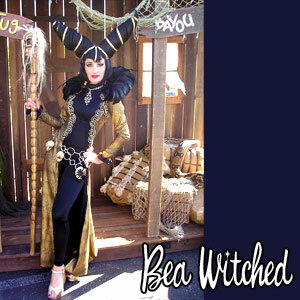 This saucy sauced up witch casts a spell on your guests (insert cackle here). 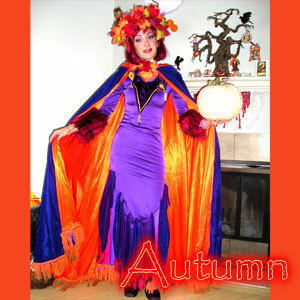 This gentle, good witch brings in Fall's bounty. Hogwart's favorite substitute teacher. Specializes in spells that don't involve spelling. Teaches magic and facial transfiguration. She would tell you her feet are killing her, but she's already dead! Gives out attitude and candy that'll rot yer teeth. Straight from Albunny, NY. 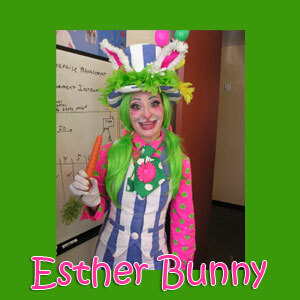 Interests include growing 24 karat carrots and making people hoppy. He doesn't say much but he sure is cute and cuddly. 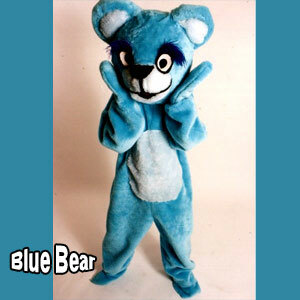 Great for photo ops and bear hugs. Web Design & Illustrations by Matthew Simmons Copyright 2011 © Super Gigi™ All Rights Reserved.